The Devils take over the top spot. The Kings, Bruins, Wild, Canadiens and Oilers move up. The Sharks, Isles and Flyers fall. Toronto, yes, TORONTO makes a move upward! New Jersey has won four straight. 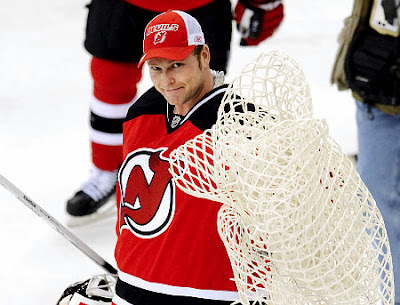 Brodeur tied Sawchuk’s shutout record and everyone is clicking. Wasn’t this to be a down year for the Devils? The Caps just keep on winning. Ovechkin/no Ovechkin, Varlamov or Theodore… Washington scores and scores and piles it on until Buffalo’s Ryan Miller closed the door on Wednesday. Lost a potential Finals preview to Chicago in OT without Crosby and then had a letdown game against the lowly Hurricanes. However Pittsburgh redeemed themselves Thursday by halting the Canadiens’ win streak in Montreal. The Sharks have lost three in a row, including a shootout loss to St. Louis and in OT to the Kings. Five of their next eight games are at the Shark Tank which should help halt the recent skid. Chicago is winning with defense. Byfuglien and Versteeg punched in OT winners in tight, low-scoring affairs. Winning three straight in both, high and low scoring contests, the Kings put up one more tally than their opponents. Good teams just find ways to win, and L.A. is looking really good. Defense is the theme in Calgary as well in December. Either scoring or limiting their opponent to one goal in each game, Iginla and Co. would like to give Kippy a little more wiggle room in net. Looking to make Phil Kessel sorry he didn’t offer the hometown discount this offseason the Bruins punished Toronto in a home and home series scoring twelve goals in the two victories. The Avs closed out a rather lengthy road trip with a pair of victories, but let down the home crowd by getting shut out by the Wild upon their return. Colorado has been a little inconsistent as of late, but still look like a contender. Winners of three of their last four… who are these high flying Predators? Nashville has not been held to less than three goals in any game this month! The Coyotes had not lost in the month of December until running into a hot Los Angeles team on Thursday. The Kings prevailed in a shoot out; therefore Phoenix still has yet to lose in regulation. Now if the NHL could convince a few locals to actually come see how good this team is. THAT would be a real win. The Sabres have lost two of three. The team is not scoring, requiring Vezina candidate goaltender Ryan Miller to shut out opponents to win. Maybe Miller could let a few soft ones go by him in practice to boost the team’s forwards confidence. The Canucks have lost two of three but rebounded at home to beat Atlanta Thursday night. Daniel Sudin has been red hot and scores whether the rest of the team contributes or not. Keeping it close in regulation but can’t get over the hump in the extra time. The Stars have lost their last two games in a shoot out and OT. When does the coach speak change to “We’ve got to put together a full 65 minutes…”? The Wild have gone, errr wild scoring five goals in each of their first three games this month…all wins. They were shut out in Phoenix, but returned the favor by shutting out Colorado on the road the following game. It’s been a bumpy December for the Sens. Notching their only victories against the downtrodden Ducks and the floundering Flyers. How’s that for alliteration? Offense has eluded Atlanta. The Thrashers have not scored more than two goals in any game in December. Their four game road trip was mostly unkind, maybe some home cooking will help Kovalchuk and friends find the back of the net again. The Jackets made a minor trade with St. Louis this week and have lost two of three. Despite their skid Mason has looked solid again and Rick Nash ended his goal scoring draught. The Canadiens had won three in a row before Pittsburgh halted their streak at home on Thursday. Price has been playing better and they are starting to get some secondary scoring. The Wings have battled, but still have lost three of their four games in December. The team took another hit, losing forward Daniel Cleary for about four weeks. Detroit can’t seem to get on track this season. The Oilers have won four straight. Horcoff punched in two consecutive shoot out winners and Edmonton suddenly is climbing the standings. St. Louis showed some offensive spark last week, but scored only one goal in their last two. Lucky for them Ty Conklin decided to shut out his former Detroit club in a 1-0 squeaker. Tavares has been scoring goals in bunches but spotty defensive work by the rest of the club has spiraled the Isles into a three game losing streak…even giving the Flyers a win along the way. Marian Gaborik has yet to score in December and the Rangers have only one win this month. See a connection? If Gaborik doesn’t do it, practically no one else will. The Lightning have won just one of their last five and must be thankful that Philadelphia is in a bigger slide to take some heat off. How long until “Vinny watch” starts in Tampa? What’s that? It already has? The Flyers have to feel lucky that the Islanders took a night off on Tuesday, or they would be starring at a seven game losing streak. No matter… this Flyers team is still in a heap of trouble. Could the injury to Emery actually be a good thing? Winners of four of their last six the Leafs are… umm, hot? It seems crazy, but Toronto could actually get back in it! Getzlaf and Perry have been amazing, but it wasn’t until Tuesday that Anaheim notched it’s first win in December. The team is fighting and keeping games close, but they have not been able to get on the other side of those one goal losses. The Panthers have been victims of four straight losses. They are still getting extraordinary effort from their goaltenders, but cannot score. The once surging Florida team has only Carolina to cushion their fall. Consecutive victories against Vancouver and Pittsburgh impress, but this team is going nowhere fast. Again it is hard to believe that this team made it to the Conference Final last season.